Is a Gold-Backed IRA Right for You? Having an IRA – an individual retirement account – is always a good idea for anyone other than a multi-millionaire. This is because it offers a pretty easy way to grow your retirement nest egg over the span of your career, using tax advantages to make saving even more advantageous. There are many types of IRAs, as defined by the type of assets you use with your IRA to invest. One particular type is a gold-backed IRA – an IRA that is valued based on gold, instead of stocks, bonds, mutual funds, or other assets. Converting to a gold-backed IRA may or may not be right for you. I’ll give you the basics of pursuing this particular type of investment strategy so you can determine whether or not this is the right move for you. What is a Gold-Backed IRA? A gold-backed IRA is one form of a precious metals IRA, which have been in existence for decades. According to federal regulations, you can opt to fund your IRA with precious metals instead of U.S. dollars – but the metals have to come from an approved list from the federal government. As you can imagine, gold is on the list (so are silver and platinum). There are a few things that make a gold-backed IRA different from other plans. For starters, these IRAs are self-directed. This means you make the decision as the account holder. A related difference is how you maintain assets. Stocks exist in the digital world; gold doesn’t. You have to actually keep physical gold and arrange storage for the gold through an investment firm (called the custodian or trustee by the IRS). As a result, you’ll have to pay a custodian fee that can cost $100 to $200 a year. You also have to buy certain types of metals. 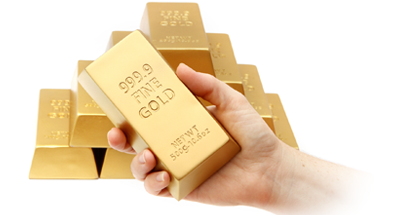 Gold, for example, must be in the form of 24-karat gold bullion bars with weights between 1 ounce and 400 ounces. Foreign gold coins are now accepted, though, as are American gold coins. Regal Assets are a company who offer Gold IRAs. They offer a free starter kit that explains it much better than I can, though feel free to hear me try further down. Gold, as I mentioned, is often a hedge against falling value in the stock market or in the U.S. dollar. When panic or uncertainty sets in, people tend to turn to gold because it is viewed as a safe store of value. People will always want it, in other words, while they may be turned off to having dollars that are prone to inflation, or stocks that can lose value in the blink of an eye. You may have noticed gold’s meteoric rise over the past decade that has coincided with the end of one stock market-triggered recession (2000-2001) and another, deeper recession (2007-2010). Over the past five years, the stock market lost over half its value at one point, and the dollar took a shelling too. As a result, gold has soared from roughly $300 an ounce to a peak of $1,896.50 per ounce on September 5th, 2011. Gold has retreated from that peak, but still remains well above the $1,550 mark. There are claims floating around that gold will peak above $2,000 per ounce in 2013, but even if the price falls a bit and settles, it could still serve another key function: guarding against inflation. If you want to keep inflation at bay, maintain the store of value of your money, and possibly benefit from an upside in gold in the future, a gold-backed IRA may be for you. They’re not inherently more complicated than any other IRA, and involve far less decision-making than, say, an IRA with a stock portfolio that has to be monitored and balanced. Of course, there are downsides. The growth potential for a gold-backed IRA isn’t as high as one based on stocks, simply because it’s hard to predict what gold will do over the next 10-30 years – approximately how long you’ll have your IRA. Remember: with the exception of a period of time around 1980 and the last five years, gold has hovered between $200 and $500 per ounce for the last 36 years. Plus, with a recovery underway – albeit a slow one – there is downward pressure on the price of gold that many investors either don’t see or aren’t willing to acknowledge. Plus, when you go all gold, you are putting all your eggs in a gilded basket. Stocks, bonds, mutual funds, and CDs allow you to at least diversify your portfolio. One option may be to include a portion of gold in your IRA – say, 15% for optimal protection against inflation. You can still benefit from capital appreciation, but you can also fend off inflation that could rise at any moment. Hey! I'm Karl and I have been a keen investor for over a decade. Learn more about my experiences and say hello! © 2019 WiseStockBuyer. All Rights Reserved.